How generous are we really? That’s the question we recently asked of the UK here at Wink Bingo. And by ‘asked’, we mean ‘sent out a survey to a thousand people to find out how exactly they’d spend their winnings if they won cash online’. Men Share More Readily It genuinely surprised us how some responses played out along gender lines. For instance, when we asked them what they’d do with a £50 win, almost one out of every 25 men who responded said they’d give part of it to charity, as opposed to only one in every 255 women – a solid tenfold difference! Increasing the winning amount to £5,000, however, we got a completely different picture: 4% more women than men said they’d donate some of their winnings to charity. What does this mean? Perhaps that women in general are more careful with their money, especially when it comes to smaller amounts (our survey also shows that more women than men are inclined to put their winnings into their savings account). It could mean another thing too: men are bigger risk-takers than women. In fact, studies show that in the workplace, men are twice as likely to take risks as women. One thing was common for both men and women, though: if they win money online, they’re both equally likely to treat themselves to a pair of designer glasses. It seems winning isn’t really winning if not done in style. Say what you want about today’s ‘entitled youth’, but it looks like they’ve got their heads straight when it comes to financial responsibility. Based on a hypothetical £50 win, 48% of all the 18-24 year-olds we surveyed said they’d save some or all of their winnings, as opposed to 35% of 25-34 year-olds and 34% of those over the age of 65. This is supported by a study that found that millennials (18-29 year-olds) are the best at saving money, with 62% saving more than 5% of their total income. Age and gender seem to affect charity-giving too, with another study showing that baby boomers and older women give 89% more to charity than men their age. The responses had stark regional variations as well. Asked how likely they were to donate to charity or share their winnings with family and friends, people in Northern Ireland, London and Yorkshire and Humber gave way more answers in the ‘very likely’ end of the scale than others. The most miserly online-cash winners? 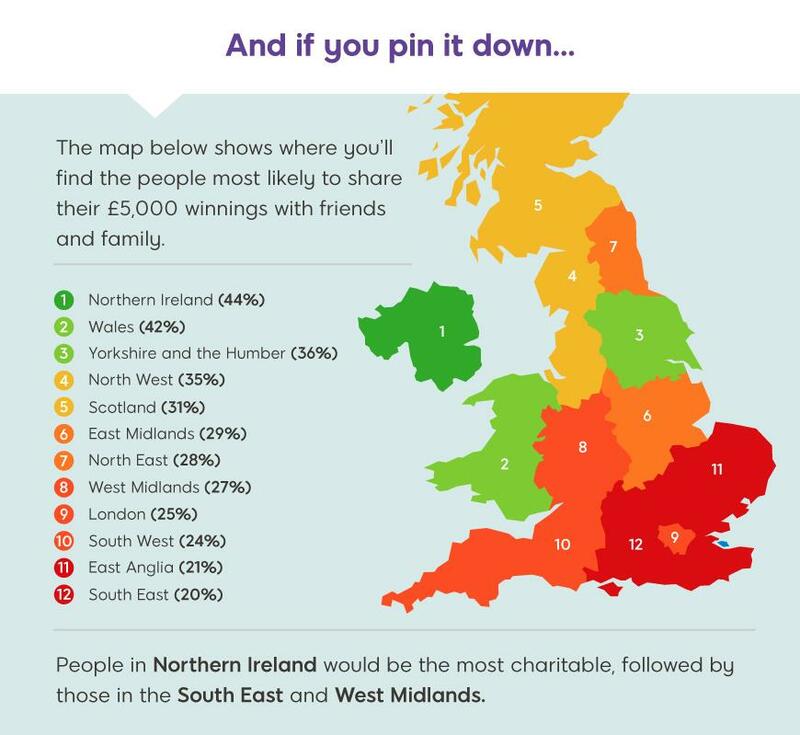 It’s actually a bit complicated: when it came to sharing with family and friends, the South East ranked dead bottom in all the categories of winnings (£50, £500 and £5,000), but strangely stayed near the top for charity donations. Those from Wales, West Midlands and East Anglia in particular don’t feel too favoured by lady luck – of all the people we asked, they think they’re the least likely to win money from online games. You’d expect lucky winners to share the good news with the whole world, right? Not quite. Almost a fifth of all the people we surveyed told us they wouldn’t even tell their partners and friends if they won £5,000! It’s kind of understandable. Big winners especially can expect to feel pressure from friends and family (and sometimes even the general public) to share their winnings, which can then make them feel guilty and even suffer from low self-esteem. Still, the responses do raise some more questions. How long can you keep your winnings a secret? What would you spend it on if you don’t want any evidence of your new-found wealth? What person doesn’t share good financial news with their significant other? What else are they hiding? !